dorky jammie joy – Naming a blog is harder than naming a kid. These are Owen’s favorite pajamas bar none, if they’re clean he wears them. They turn him into a real dog. But though Amazon has a wide variety of Leveret clothing at prices comparable to those on Zulily, they only sell this pattern in one size, his current, and I’ve been dreading his growing out of them. But WHEW, today Zulily has the next size up so I just nabbed them. 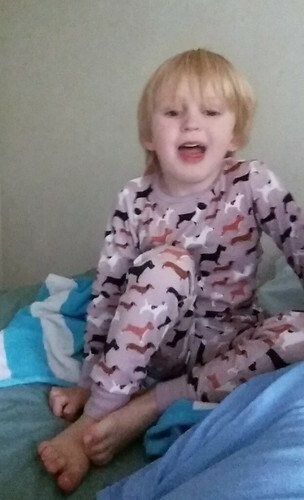 We got them last spring when I asked him if he wanted anything special for his birthday, and he shouted “PINK DOGGIE JAMMIES” like he’d had it on his mind in awhile. So I searched for pink dog pajamas on Amazon and these were the only hit, and Leveret was already my favorite inexpensive pajama brand. They are so soft and comfy. They don’t last quite as long as, say, Hannas, but they last, are a lot cheaper, and we don’t have a stack of kids to hand durable clothing down through.